Newtonmas fractals: conquering the second dimension! It is Newtonmas, so time to invent some new fractals. 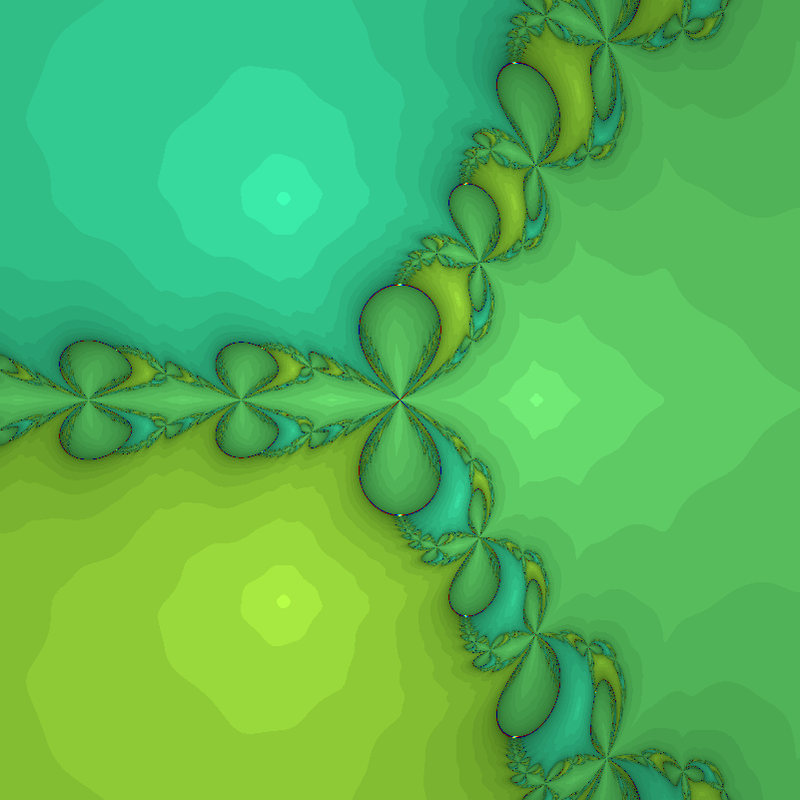 Complex iteration of Newton’s method for finding zeros of a function is a well-known way of getting lovely filigree Julia sets: the basins of attraction of the different zeros have fractal borders. But what if we looked at real functions? If we use a single function the zeros will typically form a curve in the plane. In order to get discrete zeros we typically need to have two functions to produce a zero set. We can think of it as a map from R2 to R2 where the x’es are 2D vectors. In this case Newton’s method turns into solving the linear equation system where is the Jacobian matrix ( ) and now denotes the n’th iterate. The simplest case of nontrivial dynamics of the method is for third degree polynomials, and we want the x- and y-directions to interact a bit, so a first try is . Below is a plot of the first and second components (red and green), as well as a blue plane for zero values. The zeros of the function are the three points where red, green and blue meet. We have three zeros, one at , one at , and one at The middle one has a region of troublesomely similar function values – the red and green surfaces are tangent there. 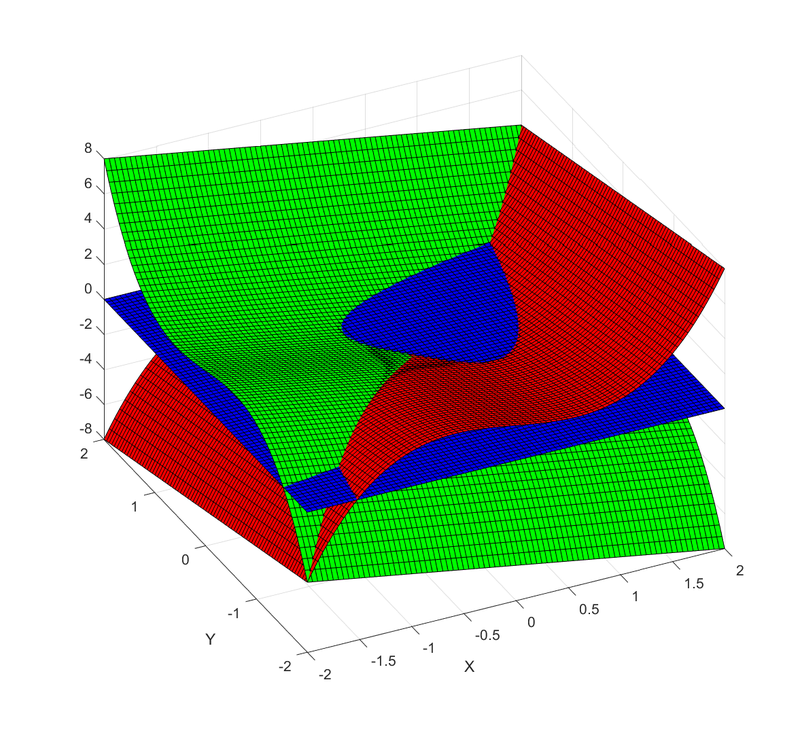 Plot of x^3-x-y (red), y^3-x-y (green) and z=0 (blue). The zeros found using Newton’s method are the points where red, green and blue meet. Behavior of Newton’s method in 2D for F=[x^3-x-y, y^3-x-y]. 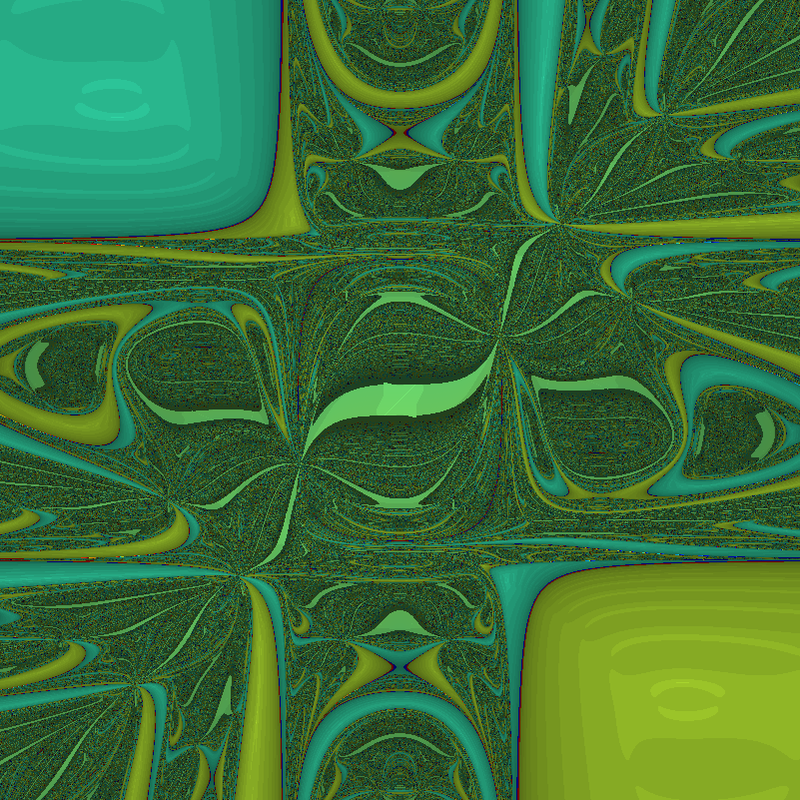 Color denotes value of x+y, with darkening for slow convergence. The troublesome region shows up, as well as the red and blue regions where iterates run off to large or small values: the three roots are green shades. Why is the style modernist? In complex iterations you typically multiply with complex numbers, and if they have an imaginary component (they better have, to be complex!) that introduces a rotation or twist. Hence baroque filaments are ubiquitous, and you get the typical complex “style”. But here we are essentially multiplying with a real matrix. For a real 2×2 matrix to be a rotation matrix it has to have a pair of imaginary eigenvalues, and for it to at least twist things around the trace needs to be small enough compared to the determinant so that there are complex eigenvalues: (where and if the matrix has the usual form). So if the trace and determinant are randomly chosen, we should expect a majority of cases to be non-rotational. Moreover, in this particular case, the Jacobian tends to be diagonally dominant (quadratic terms on the diagonal) and that makes the inverse diagonally dominant too: the trace will be big, and hence the chance of seeing rotation goes down even more. The two “knots” where a lot of basins of attraction come together are the points where the trace does vanish, but since the Jacobian is also symmetric there will not be any rotation anyway. Double guarantee. 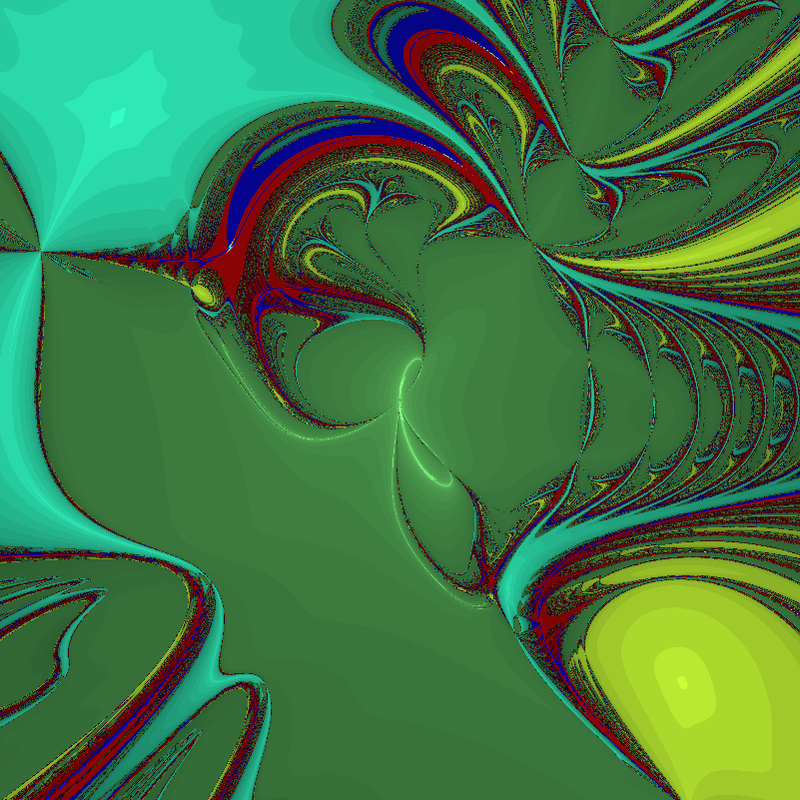 Can we make a twisty real Newton fractal? If we start with a vanilla rotation matrix and try to find a function that produces it the simplest case is . This is of course just a rotation by the angle theta, and it does not have very interesting zeros. Basins of attraction for Netwon’s method of twisted cubic. theta=1. Basins of attraction for Netwon’s method of twisted cubic. theta=0.1. Basins of attraction with rotation proportional to x. Quite lovely, although still not exactly what I wanted (sounds like a Christmas present). It might be easier just to hide the complex dynamics in an apparently real function like (which produces the archetypal Newton fractal). 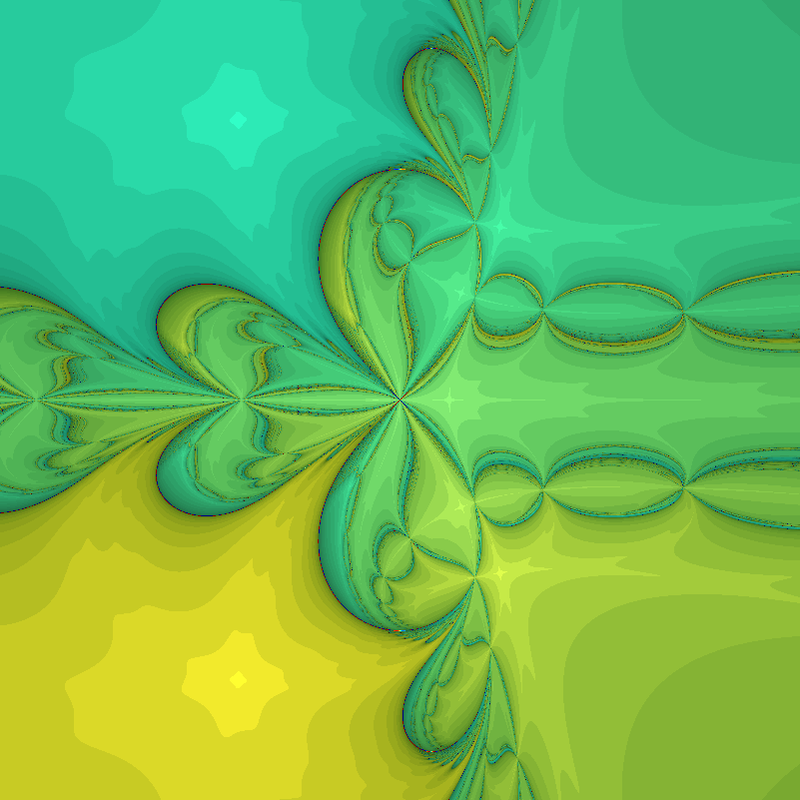 Newton fractal for F=[x^3-3xy^2-1, 3x^2y-y^3]. Red and blue circles mark regions where iterates venture far from the origin. 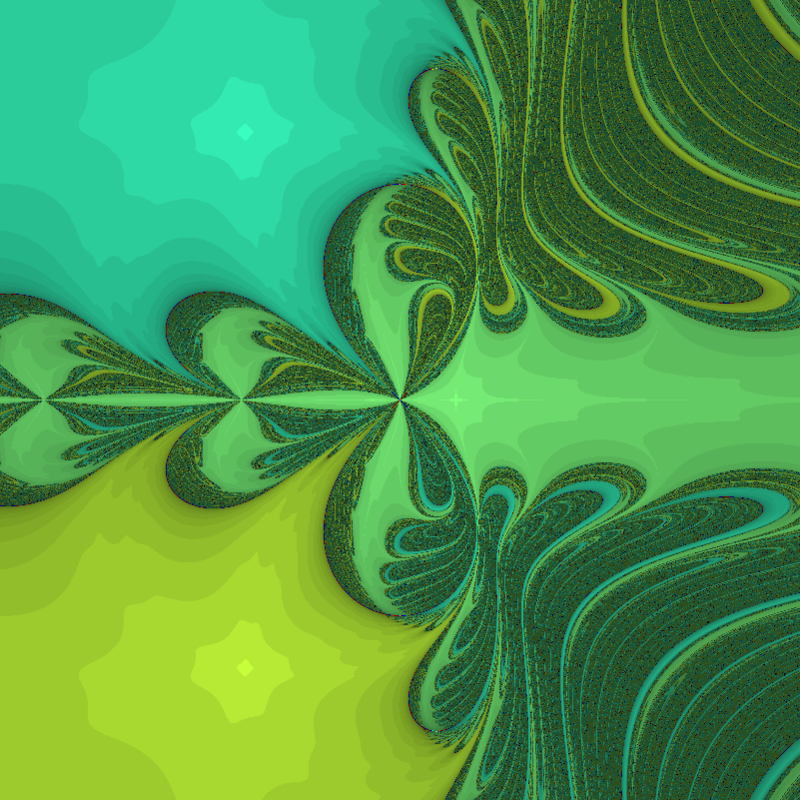 Perturbed z^3-1 Newton iteration, epsilon=1. 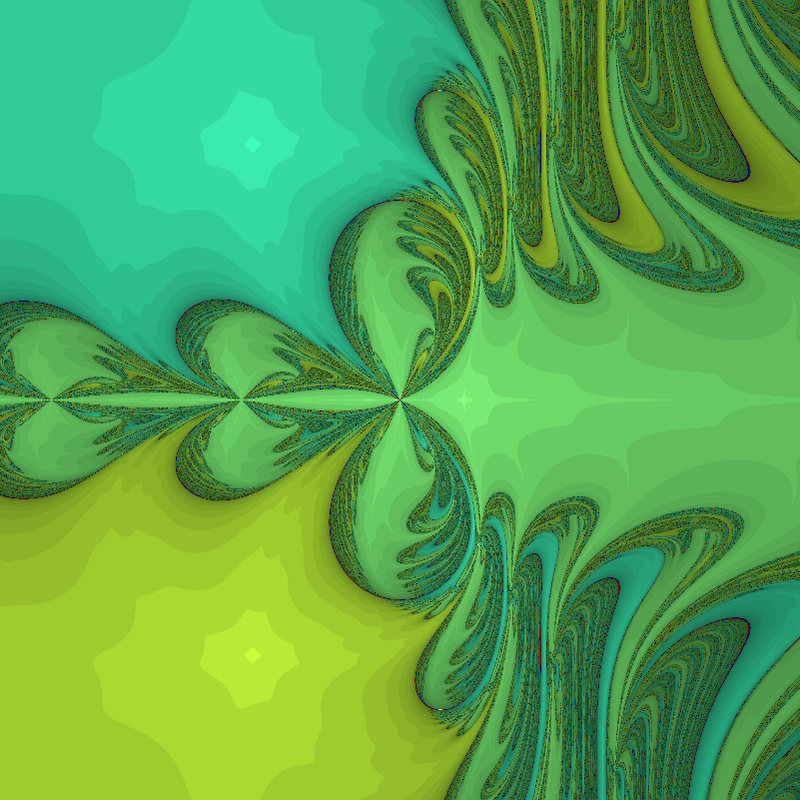 Perturbed z^3-1 Newton iteration, epsilon=2. Perturbed z^3-1 Newton iteration, epsilon=3. Perturbed z^3-1 Newton iteration, epsilon=3.5. 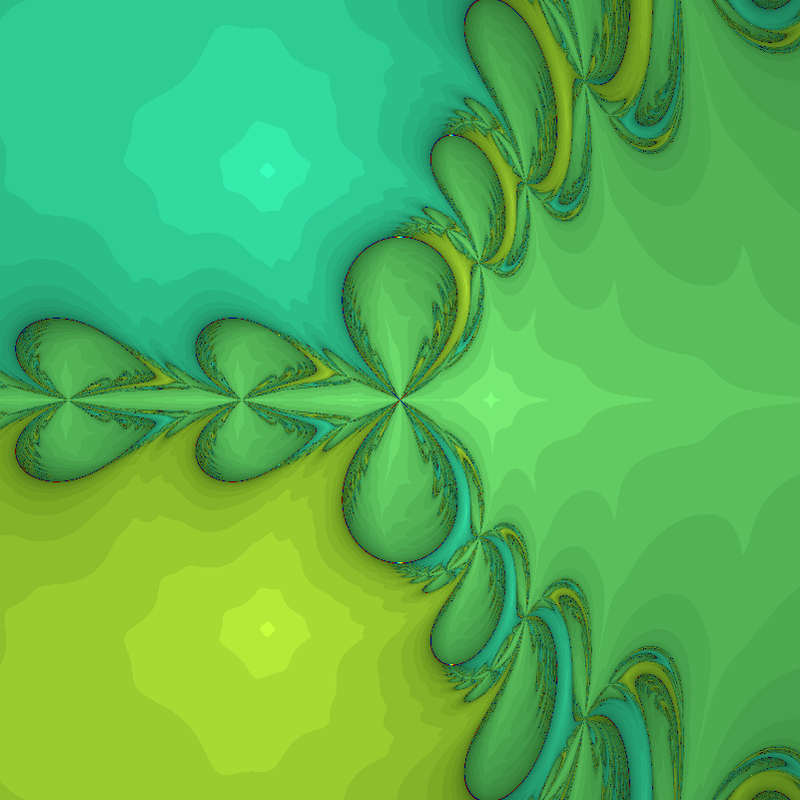 Perturbed z^3-1 Newton iteration, epsilon=4. In the end, we can see that the border between classic baroque complex fractals and the modernist swooshy real fractals is fuzzy. 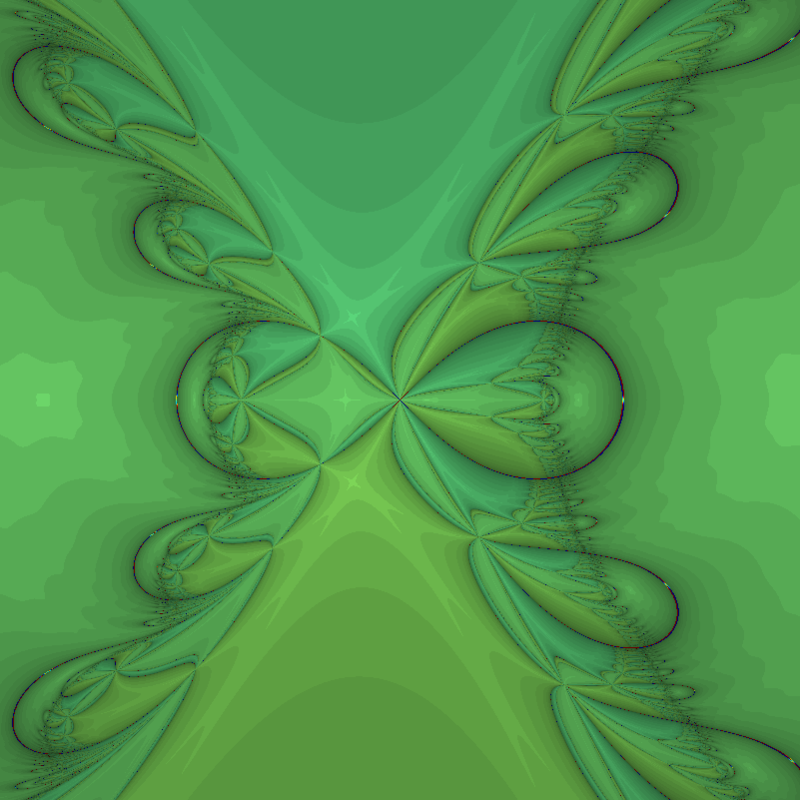 Or, indeed, fractal.